FRGCB - Finnish Retro Game Comparison Blog: TWOFER #12: Cosmi horror! Written for the Commodore 64 by Paul Norman. Converted for the Atari 8-bits by Vance Kozik. Published by Cosmi in 1983. Written for the Atari 8-bits by Robert T. Bonifacio, and published by Cosmi in 1983. Re-written for the Commodore 64 by Paul Norman, and published by Cosmi in 1984. I guess there are plenty of folks out there who have been waiting for a comparison of the original Forbidden Forest, since it has that certain sort of a status, and I think I might have mentioned it in one of the Unique Games entries when the sequel was included. Well, since it was originally supposed to be done during my first year, and I'm already doing my third one, I thought I might as well finally include it in this year's Halloween set, and couple it with another Cosmi classic. Similarly to the Elite twofer last month, it's time for another versus battle between two computers with two games for the price of one. Both Forbidden Forest and Caverns of Khafka are old enough to have very hard-to-find reviews from dedicated press, but at least the former title has remained a steady favourite among retrogamers. 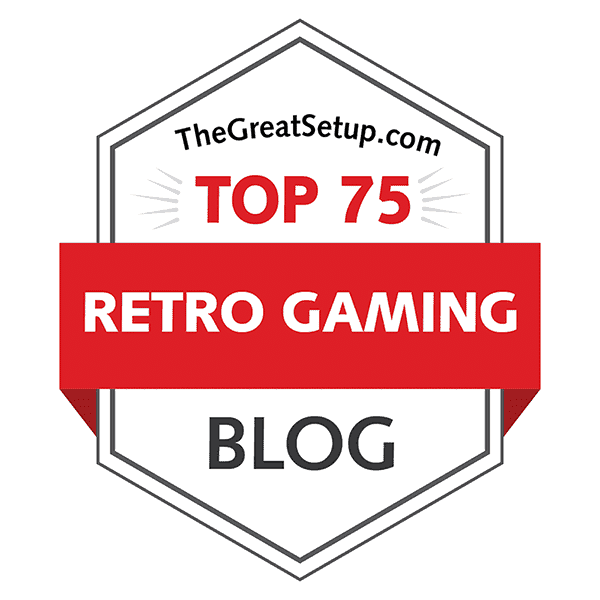 The original version currently has a round 8 out of 10 from 174 votes at Lemon64, placing it at #86 in the Top voters list from at least 100 votes, while the Atari conversion has a 6.2 from 34 votes at Atarimania. Caverns of Khafka doesn't have as much of a following, but at least it has mediocre scores: a round 7.0 out of 10 from 62 Atarimania voters, and 5.9 from 40 Lemon64 voters. Since both games are relatively unknown to myself, and particularly the latter one, I'm actually rather eager to see is there any truth to these scores. Forbidden Forest is one of those games that should need no introduction, but since I didn't really understand properly what to do in it until very recently, I'm fairly certain that there are more of you out there who have a similar problem. The game is actually quite simple, really - first, you need to learn how to aim and shoot with your bow in a rather curious representation of a three-dimensional environment that only scrolls sideways. Unfortunately, you are set against super-sized monsters right from the start, so you have little time to adjust yourself to the shooting mechanics. The game starts out sometime in the afternoon, and every time you clear a level (kill a number of monsters), the time moves a bit towards the darkest night, and you have eight different levels to clear before you are faced with the ultimate evil. But basically, it's just running, aiming, shooting and avoiding. While it all sounds rather simplistic so far, you also need to learn how each type of monster acts, so you can attack at the right time, and that be challenging. It's what almost ruined the game for me in the beginning, since I only had a turbo tape version of it and no instructions whatsoever, so I didn't know how was I supposed to get anywhere in the game. Happily, I was persuaded to give it a proper go by my friend Bob, who helped me on getting started, in a manner of speaking. Now, I can appreciate the game's unique nature and its quirks, and I can only recommend it highly to anyone who has never had the chance to play it. Caverns of Khafka is one of those other kinds of games that I wish was better documented on the internet. It's one of the most irritating arcade adventures that I have ever come across on the C64, and one of the strangest re-writes in the history of gaming. If Aztec Challenge was a strange two-some, Khafka beats it by a good mile or two. The ATARI version of Khafka is a fairly simple collect-and-avoid'em-up kind of a platformer, in which you need to navigate through a large maze of caverns, collect a number of treasures and avoid getting trapped or hit by enemies too much. After collecting the required number of treasure, you start the whole thing all over again on a higher difficulty level, which features more hazards. The C64 version of Khafka looks more like a Cosmi game as we know them, and in a familiar Paul Normal style, it is horror-themed and more vicious than its Atari counterpart. Also, the game plays completely differently and features lots of unique aspects to it that set it completely apart. But is it any good? As much as I would like to say no, I'm not entirely sure it isn't. Granted, it's not a particularly comfortable game, but it is something completely different than any other game of its kind that I have ever played, so it has something going on for it. Apparently, the idea in the C64 version is to collect some sort of keys from a large underground maze that has to be navigated in a platform-like manner, but with the help of a lift, some ropes and weapons. Then, once you have collected all the keys - five of them, to be more specific, and opened the door to Pharaoh Khafka's chamber, you have to deal with Khafka's guards. I cannot explain it properly here, so you will have to wait until the Playability section. But merely for educating yourself on the history of one of the most important early game developing companies, Caverns of Khafka should be considered a necessary bit of knowledge in both occasions. But I don't think I would necessarily recommend either game to a younger generation of beginning retrogamers. All the Atari tape versions I found on the internet were basically the same, even if they were released by a different publisher, so I assume the same tape master was used for all releases. If anyone has any differing information on this matter, please do send a comment at the bottom of the page. Anyway, when I get my hands on the Atari Khafka tapes, I'll update this section properly. Cosmi games aren't known for their games' accessibility, because they are fairly experimental - at least the games by Paul Norman are. Most of their early games were surprisingly huge hits, however, most likely due to them being so different from the norm. Probably the primary reason why Forbidden Forest is often considered as one of the most important games of the early 80's, is because of its revolutionary pseudo-three-dimensional gameplay, although the atmosphere helps a lot. You would walk the looping bit of forest left and right, come across some great horrific monsters and either run away in panic or attempt to hunt them down. As the game progresses, your surroundings get darker and more dangerous as the night begins to fall. Your only weapon is a clunky crossbow, which can be a bit tricky to use. Anyway, let's take care of the basics first. In both versions, you use the joystick to run left and right, but the archer has a slow turning cycle, so you will need to act fast whenever a monster shows up, and align yourself in time into doing whatever it is you feel is the best choice of action at any given time - run or attack. Shooting with your bow is a fairly slow process, since you have to load the bow with an arrow before you can actually aim and shoot. Also, before shooting, you have to turn your archer into a preferred angle, and pushing the fire button after aiming thus will release the arrow into your chosen direction, more or less. The only thing you actually have to worry about in three dimensions, in a way, are all the trees, bushes and other obstacles coming your way to potentially ruin an otherwise good shot, since they can block the arrow's path for hitting an enemy. Otherwise, as much as you would like to imagine, the game works in a fairly two-dimensional manner. Just shoot where the enemy appears to be, and you will very likely hit it. Uniquely, in the C64 version, you can also adjust the arrow's peak trajectory by pulling the joystick up or down when you're not moving left or right. This I have rarely found of any actual use, but it's a nice idea. Forbidden Forest also has four difficulty levels: innocent, trooper, daredevil and crazy. The original gives you a choice before the game starts, while the ATARI version starts off from the beginning and moves on sequentially. If you have no idea what to do, even the easiest one can prove to be too much for you, but once you've figured out what to do, the game offers a fairly balanced raise in difficulty. Playing the game on higher difficulty levels will increase the amount of monsters you need to kill in order to proceed, as well as the speed and anger level of the monsters, although the ATARI version only makes the monsters faster on the first level-up. The last two difficulty levels even give you less arrows, in that the quivers are not replenished after every set of monsters. In my experience, the C64 version can be a bit unfair when you get to the final monster, but by comparison, the ATARI version is a bit too soft on you, since Demogorgon takes about two minutes before he gets bored of waiting for your move and attacks you instead. But the thing is, you can't see Demogorgon for more than a fraction of a second when it does appear on the C64 version, and the C64 version is more of a cinematic experience than a fair game, which is exactly how Paul Norman designed it to be. Also, in addition to a scarier final boss, it offers more monsters than the ATARI version. The Atari version is missing the army of giant frogs (third segment on the C64) and the great snake (sixth segment on the C64), and then of course, Demogorgon is a lot easier to focus on in the Atari version, since it stays on the screen for longer periods of time, compared to the quick flashes on the C64. Then again, you can do some adjusting on the C64 that you can't do on the Atari, so there's that advantage gone to waste. And of course, saying that the C64 original is a more cinematic experience means exactly that - apart from the dance segments between monsters, the ATARI version has no intro sequence or a proper Game Over sequence. But then again, this can only be considered of debatable interest, whether it affects the playability or not. It is a bit silly and, frankly, useless even attempting to make a comparison of the two versions of Caverns of Khafka, since they're almost entirely different games. The only two things that connect this game are its name and its base genre, which is a platforming adventure. You also need to collect items in both games, and both games take place (mostly) within a large cavernous maze. But that's pretty much it, and it's a challenge in itself to try and find more things that connect the two games, rather than to compare them. So, contrary to what I would normally do, I shall not give any points for winning any of the sections one way or the other. But I shall have to explain the gameplay for both cases regardless of their extreme differences. You control your chosen version's hero with a joystick. While the ATARI version features jumping upwards and into one of two directions, climbing and ducking, it's not much compared to the thirteen functions on the C64 version. Our hero on the C64 can throw and climb ropes, move the lift (or elevator) up and down, crawl, run, walk and even shoot, and the most important action concerning the progress of your game: placing a seal (one of the items you need to pick up) in the tomb door (at the bottom middle of the map). For some of these actions, you need to have the fire button depressed, but at least there are no keyboard commands other than pause. In both games, you begin with five lives to lose. Also in both games, you have some optional routes to explore and find items from, but there is a goal to achieve, which in both games requires collecting items. The ATARI game shows quite a large portion of the game area at once - meaning, everything looks very small on the screen - and you can see a good deal of where to go, what to get and what to avoid. The C64 game, by contrast, shows a fairly small area of the game map at a time, focusing on the near vicinity of your character, so you will not only have more trouble avoiding hazards, but also you will have a harder time making any sense of the game map. While the ATARI game can be considered a fairly obvious treasure-hunting platformer with obvious hazards and uses of your abilities, the C64 game requires knowledge and experimentation with your tools and the environment, because it doesn't work all that logically, at least according to real world laws of physics. I don't really need to explain any more of the ATARI game, since it doesn't actually need explaining more than that, but those of you, like me, who never got the hang of the C64 game, there are some things worth telling before I move on. The five seals you need to collect in the game are always located randomly, and you can only find and pick one at a time. To find a seal, you need to listen for the siren-like music of lost spirits that will help lead you to the seals. You only need to pass over them to pick them up, but sometimes you might need to crawl through passages in order to get to them, or even throw a rope. Once you have collected a seal, you have a random period of invulnerability time. Another thing you should be aware of is, that the lift can be summoned with the joystick. For further guidance, the manual for the C64 game can be found at ReplacementDocs. Although I decided not to give any points for this game in any section, that doesn't mean I can't give my opinions on the game's all three main comparison points. So, would I recommend the Atari version more, or the C64? Depends. If you're into more arcadey action kinds of games with no learning curve whatsoever, the Atari version will offer you a nice alternative to all those other cavernous treasure-hunting platformers of the time. It's fun, but offers a fair challenge. If, however, you're into games with depth and which require some time to master, the Paul Norman version of Khafka will certainly offer that sort of a challenge. And of course, for Paul Norman fans, you do get the pseudo-cinematic interactive experience that you know his other games so well from. But do I like either game better than the other because it's more playable? Actually, yes, because the C64 version features some irritating gameplay quirks, that will occasionally make you go through solid ground and whatnot, making you die from the collision, making the game particularly unpleasant to play for any longer period of time. And time is what you need to learn the gameplay mechanics properly. So, the ATARI game is what I would recommend more easily. From when I was a young gamer to quite a while ahead in time, nice graphics would be the primary criteria on which I picked the games I would want to play. Even in the 1980's, Cosmi games never managed to pique my interest, because the graphics looked awfully messy and blocky. Back then, I had not the ability to appreciate the work that went into creating the Paul Norman graphics style, nor did I really give much thought to how groundbreaking they must have been at the time of creation. To be honest, the graphics in Cosmi games still tend to put me off a bit, but at least now I can understand and appreciate them better. 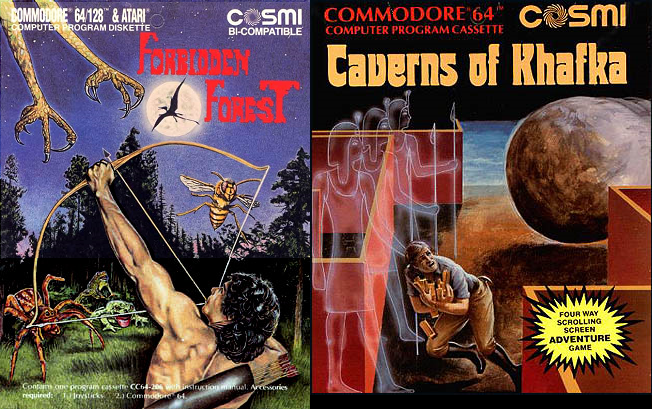 Considering that Forbidden Forest was the first game programming effort from a then 31-year old Paul Norman, managing to digest the 6502 machine language programming quirks to such an extent as to be able to create a pseudo-3D environment could only be called hugely impressive. So, I can only imagine Cosmi giving this game to someone for an Atari conversion, the goal being to make it as compatible as possible with all the Atari computers of the time. Of course, this meant some cuts, but you might be surprised at how much was actually cut from the Atari version. Title sequence from Commodore 64 (animated, above) and title screen from 8-bit Atari computers (below). The ATARI version features no proper title sequence, but instead, it has been given a very basic title screen, featuring the game title, the publisher, the original and conversion programmers' credits and the copyright, with some random colours used in the text. For the original, Paul Norman created a very haunting bit of animation with very fitting music, which I will get into later on. It starts off at a random spot in the forest, with big, blocky red letters saying "COSMI" that anyone with some small bit of knowledge in C64 basic language could do, while a red dragon is flying around. This is followed by the red dragon coming closer to the screen and the slightly more eloquently drawn game title showing up with the creator's name underneath of it. Finally, the dragon passes the camera much closer than usual, and the archer is abruptly placed on his place. Also, before any of this happens, the C64 version gives you the difficulty level options in the system font characters and graphics. Screenshots of levels with the giant spiders, the giant bee and the wraith and the skeletons. Top row: Commodore 64 - Bottom row: Atari 8-bit. Now that we're in the game, let's start by looking at our protagonist. The C64 version features a believable hero in black pants, blue jacket and a blue hat, with a white bow and a white quiver on his back. Also, his stances are fairly well drawn, so that for the most part, he certainly looks his part. On the ATARI, the archer is wearing an orange t-shirt and blue pants, probably jeans. His bow is more traditionally brown like wood usually is, and the quiver is of the same colour, but less noticable. Also, his poses are not quite as believable as in the original. The forest itself consists of trees that I can't really say what they're supposed to represent, but they are for the most part quite fitting for the game's horror theme. Also, there are plenty of bushes around in both versions, but then the C64 original is set apart from the ATARI version by having some watery bits here and there, as well as a small man-made structure with something that looks like an entrance or a rain shelter, and four red pillars around it. Both versions have a darkening sky in the background, but the C64 version also features a round white moon, according to which the daylight turns into night eventually. The ATARI game has no moon, and it goes from day to night a lot quicker. In the above pictures, not only you can see some changes in the time of day and different spots in the area, but also some proof of how the parallax scrolling effect works on the C64, as well as some of the monsters featured in both versions. Generally, the C64 monsters are slightly wider and more detailed than they are in the ATARI version, and it's also worth noting that the monsters are also more diligently animated on the C64. Sometimes, though, the ATARI monsters have more colour in them, but whether or not it makes them look any more threatening, is another matter entirely. The dragon and two different shots of Demogorgon - with and without lightning + closer and further away. Well, to be brutally honest, I'd say no, it doesn't. At best, the ATARI version looks like a cheap, hastily made conversion, which has remarkably little in common with the original's graphics. I mean, look: the red dragon looks like an invalid red bat, and the almighty Demogorgon looks like an oversized ant larvae or something. Even with the lightning in the background, it looks silly, rather than something properly demonic and frightening. Just because it's blocky, doesn't mean it has to look like the effects of last night's binge drinking. Archer's death sequence examples. Top row: Commodore 64. Bottom row: Atari 8-bit. Still, it wasn't the scary monsters or the parallax pseudo-3D scrolling that made this game such a huge deal back then, although they certainly helped. It was the number of brutal ways you could get killed by all those different monsters. The original version has a unique death sequence for almost every monster that kills you, but the ATARI version, forced to be made to be compatible with all the lesser Atari machines, settled for just two default death animations: one in which the archer just spins around a few times, and the other in which the archer slowly disintegrates. Only the segment in which the archer is killed by Demogorgon looks very different on both machines, but I shall leave you to find it out for yourselves. For some reason, though, the Atari version is unable to show everything correctly on occasion, and so, for example, the body of the giant bee vanishes when it kills you, leaving only wings to flap. Monsters' death sequence examples. Top row: Commodore 64. Bottom row: Atari 8-bit. At least in one aspect, the ATARI version wasn't cut unnecessarily much, but some cutting was done nonetheless. Whenever you kill a monster, you will see some sort of death animation, mostly some colour-scrolling based effect. In the case of the wraith's death, it also disintegrates, like in the original. In the original, every monster dies clearly differently. The spiders spurt blood and do a blue-and-white stripy effect, the giant bee explodes, the giant frogs turn yellow and slightly deformed, the red dragon falls down in flames, and so on and so forth. Basically, the C64 version still has the upper hand. Above: the C64 dance sequence loop. Below: a random take on the Atari dance sequence. The dance ritual always struck me as a very weird thing to have in this sort of a game, as if the archer has nothing better to do with his spare time between killing horrendous monsters than bust a few moves. But regardless of its strangeness in the context, it's nice to have a breather between levels that doesn't have a black screen and a regular "Player 1, Level 3, Get Ready!" sort of a thing, even if it takes a while to end and move on to the next phase in the game. 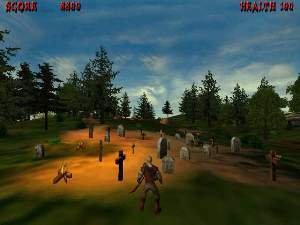 Since Paul Norman apparently did all the work in pure machine code, it was necessary to re-use as much of the graphics as possible to free up the memory for the actual game content, which is why a lot of the background graphics look a bit strange and messy, but also why the dance animation consists of the archer's walking and bow-loading animations. In the original C64 version, the dance animation has 8 particular frames looped, while the ATARI version makes the archer do random aiming poses throughout the dance. In a way, the C64 version of the dance actually looks more like a proper dance, since it's choreographed, but in the ATARI version, the archer only has a vague idea of what he's supposed to be doing. Exclusive material from the C64 version, including the giant snake, the frogs and the Game Over things. Although most of the C64 exclusive graphics have been dealt with already, there are some other things that you will not be able to see in the ATARI version, the most important ones being the two missing monsters - the giant snake and the giant frogs - both of which feature some new graphics in deaths and kills in addition to the actual monsters. Also, the C64 version has a proper Game Over screen, which doesn't actually say "Game Over" - it's just the game title on black background with the red dragon flying around again. After a while, you will also see some instructions regarding the situation, but that cannot be considered graphics as such. So, in the end, no matter how close the Atari version might look like the C64 original at first, it just doesn't have enough of content, detail or depth in order to be able to compete with it. The original wins this round easily. Okay, since it's already clear that this game is so very different on both platforms, I think it's only necessary to show you some random screen from the two games separately, so you can see how useless it would be to make a proper comparison of these two. Left: Atari title screen (animated). Middle and right: C64 title sequence. For the sake of comparing something, there's always the title screens which hold as much importance here as in the previous game, so we can look at both versions side by side. The Paul Norman game features a familiar Cosmi introduction and an example of the game's graphics in the actual title screen, while the Bonifacio game has a simple title screen that makes good use of Atari's abilities with colour - actually, it looks more like one of those raster scrollers in numerous demos. Screenshots from the Atari version. The ATARI game takes place in a single, large underground maze with plenty of traps, enemies, items and ladders. The whole map can be fitted onto about eight full screens, but here are six screenshots showing parts of the complex in different colour modes. Some of the elements, such as the red lava bits and bridges, are animated to do some simple things, but since we're not going to compare the two games, I don't think it's necessary to dwell on it more than absolutely necessary. The C64 game mostly takes place in a single, large underground maze with even more traps and enemies, but less items and certainly no ladders - you just get that one lift in the middle of the whole map. If you ever manage to get through Khafka's doorway, you will be sent down a seemingly neverending pit, at the bottom of which you will find Khafka's chamber and his guardians. For this, I had to resort to grabbing a screenshot from the game ending offered at C64endings, because the game is so aggressively buggy and impossible to play without tearing your hair out, that I chose to spare what's left of my mental health and take the easy way out instead. Anyway, I have tried to include pictures of every action your unfortunate adventurer can perform, as well as most of the landmarks in the map and some of the monsters and traps, so you can see it's not just blue, brown, white and black. Although for the most part, it is. To me, the Atari game looks more appealing due to its classic platforming simplicity, but the C64 is more atmospheric and unique. Both versions have their own faults as well, though - the Atari version begins to scroll too close to the edge of the screen, and the C64 version is glitchy as hell, so both versions have their fair share of pros and cons. Still, if I had to choose either one for recommendation solely on the basis of graphics, I would choose the ATARI game. It has been well documented that Paul Norman never thought of himself as a gamer, and didn't really get his inspiration to making games from other games. Instead, he was more of a movie fanatic, and he thought of making his games into as cinematic experiences as possible only a natural inclination. Thus, it is no wonder that his games' soundtracks lean more towards cinema than regular game-like experiences. But what about the other versions? The main theme from Forbidden Forest, of course, is one of the most recognizable SID tunes of all time, and has been rearranged several times for instruments of older and newer technology, as well as real instruments. I'm not very sure, if any of the remakes have got the feeling quite down correctly, but then, this is a tune that is so tied in with the game and the overall feel of it, that it would be impossible to completely recreate the feel of the original SID tune. I probably need not describe the theme tune to any of you, but in case there are some people out there, who haven't heard it, take a listen here on YouTube, or better yet, play the game to get the whole experience. Forbidden Forest features a few other tunes that are triggered to play at certain events: one for when you get brutally massacred by a monster (the ascending cascade melody thing), one for when you complete a level and start to dance (the tune that doesn't sound exactly an Argentinian tango, but has a similar melodic feel to it), and then there are a few level-specific tunes to give the game an even more cinematic feel than it already has from the graphics. In addition to the very memorable bits of music, there are an adequate amount of sound effects in the game. You hear a nice swishing noise from shooting an arrow, and certain monsters make specific kinds of noises - the giant bee makes a near-deafening buzzing noise, killing monsters results in different kinds of explosions and death noises, depending on the monster. Killing the wraith is particularly memorable with its horrible scream. In the ATARI version, most of the music has been changed to something completely different, and much less thematically fitting. Only the dance bit has been kept in. If the quality of all the music couldn't be called all that dazzling (compared to more modern soundtracks) on the C64, the ATARI version drops any proper use of its multiple sound channels, and instead focuses on giving a metallic, slightly waving single instrument type sound for the new tunes, and again, only the dance music is featured much like it was in the original, although even that has been altered a bit from the end of the loop. As for the ATARI sound effects, I can tell you there's enough of those, only they're not as dramatic as their C64 equivalents, and the arrow swishing noise is missing. At least they sort of make up for the lack of properly atmospheric music, but it all only makes you wish Cosmi would have just let Kozik focus on the Atari computers with higher capabilities. Bonifacio's version of Khafka is as advanced in sounds as it is in gameplay and graphics, when compared to his earlier effort with Aztec Challenge. However, it's still miles apart from the almost completely different C64 game by Paul Norman. First off, the original Caverns of Khafka will prominently play sound effects, which are similar to many other early Atari games: random-sounding rumblings and explosion-like sounds, accompanied with random-sounding bleeps and bloops when you pick up things that raise your score. Nothing too exciting so far. After a minute or two, though, the game suddenly throws a bleepy one-channel tune at you, that somehow fits the game in all its simplicity. But that's all there is to it, and while it's adequate (if only just) for the type of game the ATARI version happens to be, it might leave you wanting for more. As you would expect from a Paul Norman game, the C64 version gives you a completely different lot of sounds to listen to. It starts off with an energetic theme tune with a similar kind of feel to it as the C64 Aztec Challenge, but of course leans more towards Egyptian than Aztec. Once you're thrown into the game without any further ceremony than what the title sequence allows, you will hear a new tune, which is much slower and depressing, but fits well with the game's overall feel, which is kind of... depressing, really. After you've walked around for a bit, you will get to hear the siren's song as you get closer to a seal you need to pick up. And of course, you get the obligatory death song, which is suitably unfortunate in its timbre. Since I haven't really managed to complete this game myself, I had to find out from a longplay video on YouTube, that once you get inside Khafka's chamber, you get another completely new (and suitably disturbing) tune for the section where you need to get past Khafka's guardians, and then the tune for when you complete the game is a faster rearrangement (or reprise) of the main title theme. As if all this music weren't enough, there are some very effective sound effects in the C64 game as well. Your gunshot, for one, is loud and noisy, if a bit lengthy. The lift's mechanical noise is fairly believable in all its clunkiness. All the roaming monsters and falling rocks have their own specific sounds, and can raise the hair on your back. As has often been said elsewhere, it's the sounds that save this game from oblivion, and the sounds are pretty much the only thing that render this game a suitable ingredient for this year's Halloween theme on FRGCB. For the sounds alone, I would recommend the C64 game, but that's not a particularly good reason to play a game in the end, is it? In many cases, the original version of any game is considered to be the best one. Rarely this rule is so truthful as it is in these two cases. Although I can heartily recommend every retrogamer to get acquainted with the works of both Robert Bonifacio and Paul Norman, if not any of the others involved at Cosmi, both of them had their hits and misses. Caverns of Khafka is mediocre at best on the Atari, and despite some sloppy bugs, is very playable and rather enjoyable. On the C64, its fine soundtrack and hauntingly broken graphics cannot save it from being uncomfortable to the degree of being almost unplayable. Both games are different enough for me to recommend both, but with caution. Forbidden Forest, on the other hand, deserves its classic status, and is fairly playable on both machines, but should be experienced as it was intended, on the C64. Screenshot from Forbidden Forest 3 (PC). 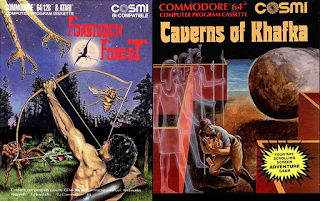 Of these two games, Forbidden Forest is deservedly the one most fondly remembered, and was blessed with two sequels - Beyond the Forbidden Forest for the C64, and Forbidden Forest 3 for the PC. The former one I have already spoken of in my last year's Unique Horror Games entry, and the less said of the latter, the better, but click here to see a video of it. There was a remake for the PC in the making about 11 years ago, but it wasn't finished, so it was let out as-is in 2011. Click here to see a video of it in action, and see if the download link for the game is still functional. Also, if you haven't spotted this one yet, C64.com has a nice interview of Paul Norman, and any fan of his games should definitely have a read.